What are app folders in Galaxy Note 7 home screen? App folders in Galaxy Note 7 home screen are just folders holding any apps. It is an analogue to folders for files in your PC. When you have many apps in Galaxy Note 7 home screen, you may have to use many home screen panels. You then have to navigate to the corresponding panel and find the app to use it. You can use app folders in Galaxy Note 7 home screen to organize apps so that you can have a neat home screen. It therefore is more efficient to find an app and then launch it. Normally, you may want to organize apps with similar functions (e.g., note taking, or photo editing), or from the same vendor (e.g., from Google, or from Amazon..) into a folder. This can help you find the app quickly. As mentioned in this guide, all apps in Galaxy Note 7 home screen are just shortcuts to the actual apps. So, you can have multiple copies of the same app in home screen. This means you can put one app into two or more app folders in Galaxy Note 7 home screen. For example, you can put Google Photos into a folder named Google (which was actually created when you received the phone), and other folders for photo browsing (e.g., together with Gallery or other third-party gallery apps). 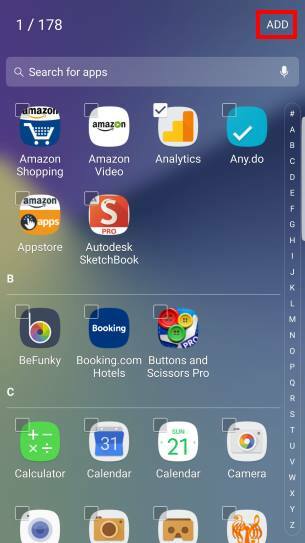 In short, app folders in Galaxy Note 7 home screen are about efficiency in locating and launching apps. But it does not support app folders in an app folder (i.e., nested app folders). Most third-party launchers also support this feature. But the method to create, use and manage app folders may be different. This guide is based on the default launcher in Galaxy Note 7. 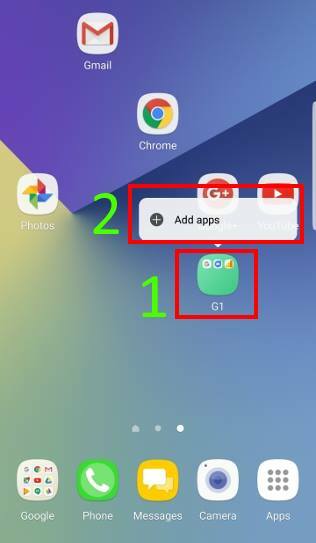 How to create app folders in Galaxy Note 7 home screen? Step 1: On home screen, tap and hold an app, and then drag it over another app. Step 2: Drop the app when a folder frame appears around the apps. Step 3: A new app folder containing the two selected apps will be created immediately after you release your finger from the screen. Please note, you can also add app folders in apps screen to Galaxy Note 7 home screen directly. 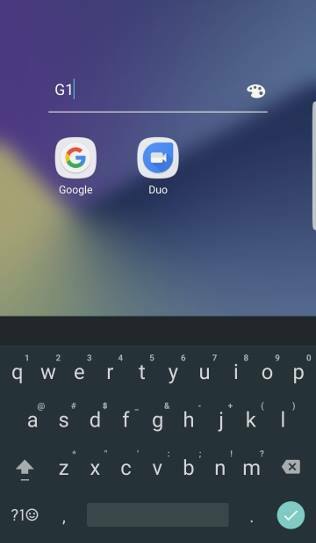 How to name and rename app folders in Galaxy Note 7 home screen? When you are creating a new app folder, you have the option to name the app folder as shown below. After the app folder is created, you can rename the app folder whenever you want. To rename an app folder in Galaxy Note 7 home screen, you can tap the app folder. Then in the app folder view as shown below, you can tap the name (marked as 1) to rename it. 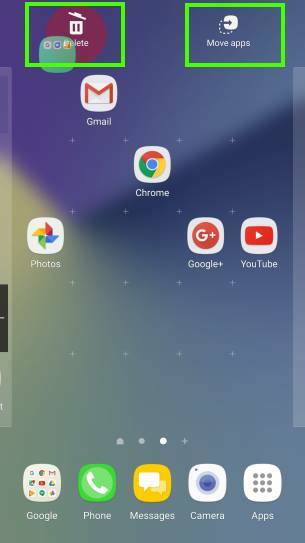 How to customize background color of app folders in Galaxy Note 7 home screen? In addition to the name of app folders in Galaxy Note 7, you can also customize the background color of app folders. Again, during the process of creating the app folder, you have the option to tap the palette icon to set background color as shown above. Just as renaming app folders in Galaxy Note 7 home screen, you can customize the background color of app folders in Galaxy Note 7 at any time. To customize the background color of an app folder in Galaxy Note 7, you can tap the app folder to open it as shown earlier. Then tap the color palette icon as shown above (marked as 2) . Now, you have the color options as shown below. For example, you choose green color. The background color of the color palette will indicate current background color for the app folder as shown below. How to add more apps to app folders in Galaxy Note 7 home screen? When creating app folders in Galaxy Note 7, you have the option to add more apps after naming it. After an app folder is created, you have at least 3 different ways to add more apps to the app folder in Galaxy Note 7. You can tap and hold an app, drag it to the exiting app folder to add it to the app folder. After tapping the app folder, you can find the Add button near the bottom. Tap the Add button (marked as 3) as shown above. Now, you are in the app selection page as shown below. You can select any apps installed in Galaxy Note 7 into the app folder. You must tap ADD button as shown below after making selections to add all selected apps into the app folder. You can tap and hold the app folder to see the Add apps option as shown below. Tap Add apps as shown below to get the similar app selection page to add apps to the app folder. In Galaxy Note 7, you can add many apps into one app folder. Galaxy Note 7 uses pagination to host 9 apps in one panel. If there are more than 9 apps in one app folder, you need swipe left or right to see all apps. In previous generations of Galaxy Note devices, you need scroll down/up to see all apps. So, it is recommended to use up to 9 apps in one app folder so that you can maximize the benefits of app folders in Galaxy Note 7 home screen. How to move an app out of app folders in Galaxy Note 7 home screen? To move an app out of the app folder, you can follow these steps. Step 2: Tap and hold the app and move it either upwards or downwards outside of the app folder range (white box). 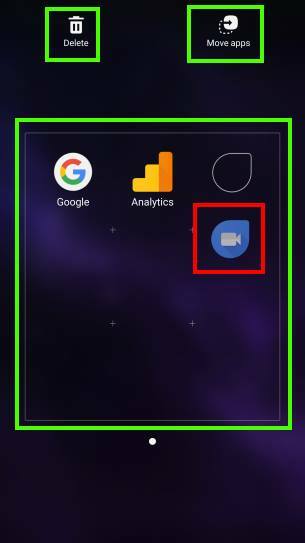 You can also use Move apps option in the top of the screen when moving the app as shown below to move the app to other Galaxy Note 7 home screen panels. Of course, you can move it to delete button to delete this icon from Galaxy Note 7 home screen. 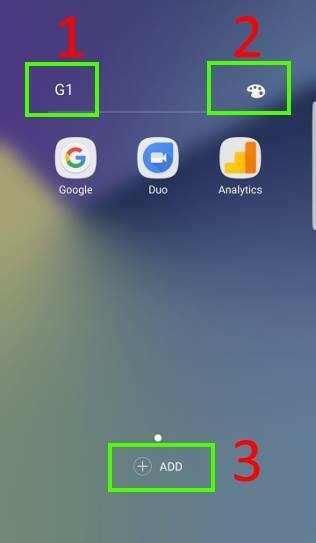 How to move app folders in Galaxy Note 7 home screen? You can move app folders to any location in the same home screen panel, or to other home screen panels, just like managing individual app icons. To move an app folder to other spots in the same Galaxy Note 7 home screen panels, you can tap and hold the app folder and move it to any desired locations. To move an app folder to other home screen panels, you can use one of the two following methods. Method 1: Tap and hold the app folder and drag it to Move apps button as shown above. Then follow the instruction to select a spot in any home screen panels (except Flipboard briefing panel). Method 2: Tap and hold the app folder and drag it across home screen panels in left/right side to a new panel, and drop it once you find the desired spots. How to remove app folders in Galaxy Note 7 home screen? You can also delete or remove app folders in Galaxy Note 7 home screen, just like what you can do with individual apps. To delete an app folder from Galaxy Note 7 home screen, you can tap and hold the app folder, then drop it to the delete button as shown above. The app folder, together with all app shortcuts inside the app folder, will then be deleted from Galaxy Note 7 home screen. Can you create, use and manage app folders in Galaxy Note 7 home screen? Do you know how to customize app folders in Galaxy Note 7? If you have any questions on Galaxy Note 7 app folders in home screen, please let us know in the comment box below.